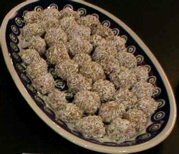 These petite coconut balls are not only beautiful, but are richly satisfying bites of earthy goodness with a taste reminiscent of baklava or a Moroccan treat. No baking needed, so they're easy to mix up and take to a party or keep some in the fridge for a healthy dessert when your sweet tooth kicks in. Most raw recipes are quite forgiving, so all ingredients amounts here are approximate. When you mix up good things that go together it always turns out delicious! Add the 1 cup coconut to the bowl and set aside. Add all other ingredients to the food processor and mix. Batter will be sticky and thick. Do not overprocess or the nuts get too oily and soft. Press the batter in your palm to form small balls, then roll into the bowl of coconut to cover all sides. Freeze for about 15 minutes then store in the refrigerator. Makes about 25 balls. Double the recipe for a party or to have more on hand as they tend to get eaten quickly! Chocolate Balls Variation - Add raw cacao or raw carob to taste. Depending on how much chocolate flavor you add you may not need much cardamom or allspice as the chocolate will overpower them. Use the leftover coconut you rolled the balls in for your granola cereal! Yum. Enjoy! For other dessert ideas, check out the shockingly easy raw berry pie recipe or my favorite recipe books.